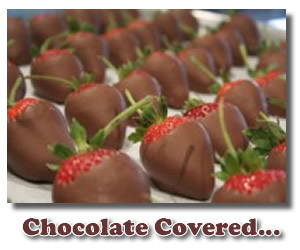 Who can resist a chocolate covered treat? Not me! It almost doesn't matter what it is that is dripping in chocolate. It's a sensational delight that is hard to resist. There are so many different delectable foods that can be smothered in chocolate to make them impossibly better and decadent. Tell me, what do YOU like to cover in chocolate? If you are like me, you won't be able to resist sampling from this selection of ideas and recipes that are simple but unbelievably good. If you aren't the homemaker type, never fear. :) You can simply order your goodies from one of the quality suppliers available online. You can get a variety of dried fruit covered in chocolate as well as fresh and juicy fruit dipped in milk, dark, or white chocolate. Mmmmmmm! 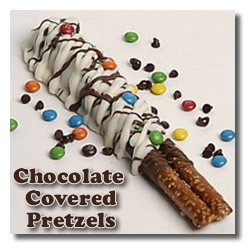 If you like the salty combo of chocolate pretzels, peanuts, or popcorn you can order them too. You can even buy them in bulk for parties or special events. I adore that special combination of saltiness that goes so well with chocolate. Because of that I really love these recipes that make that blend superbly! You will be shocked at how quick and easy it is to make these wonderful treats. You'll be everyone's favorite. Maybe you are a bit of a caffeine addict, and chocolate alone does not provide you with enough kick. Have you ever tried Chocolate Coffee Beans or the big sister Chocolate Espresso Beans? As you think about these yummy prospects, not only might you begin to drool, but your creative juices may begin to flow as well. Let's see, what shall I cover in chocolate today??? Whatever you decide, however messy it may become, I have no doubt you will enjoy the delicious experience. Can Buckeye Candy Balls Be Frozen? What Kind Of Chocolate Works Best? Why do white "snowflake-like" spots form on top of chocolate-covered candies? Why does chocolate get white dots when it sets? What is the best way to preserve chocolate truffles? Make Chocolate Covered Marshmallows with a Chocolate Bar? Which type of chocolate melts faster, white or dark? What's the best ready-made caramel to use in candy making? Choclolate Covered Candy How To Do? How Do I Make Chocolate Covered Cookies Set?